More than any other, this set of soundtracks demonstrates why Patrick Troughton is sometimes referred to as “the monster Doctor”. In this collection of serials from the end of Season 4 and the start of Season 5, not an episode goes by without an appearance by a memorable alien menace. We’ve got the crab-like Macra, the identity-thieving Chameleons, the ruthless Daleks, the cuddly - er, I mean terrifying - Yeti, and the reptilian Ice Warriors. All that are missing are the emotionless Cybermen, owing to the fact that The Tomb of the Cybermen is not missing from the television archives. Previously released on cassette and then on CD with narration by Colin Baker, The Macra Terror can now be heard with new narration, specially recorded for this box set, by Anneke Wills, who played Polly. Her voice-over finally brings this four-part serial in line with other CD soundtrack releases, in that it involves a member of the story’s original cast and is in the present tense, which lends a greater sense of immediacy than the previous past-tense voice track could achieve. Baker’s narration was also lacking in detail about certain visual information, in particular what is happening during the opening heartbeat sequence, and Jamie and Ben’s movements as they exit the TARDIS, all of which is addressed in this new version. Polly and her fellow companions also benefit from substantial roles in the story itself. Ben (Michael Craze) gets something different to do, as he is indoctrinated in his sleep by the creepy Broadcast/Propaganda Voice (Richard Beale). There are some quite sinister scenes as Ben betrays his friends to the authorities and stalks Polly through a building site. The sailor loses his accent in the process (as does Jamie in the next story, The Faceless Ones), but listen out as his Cockney dialect creeps back whenever the control wavers. There’s a real sense of terror from Polly as she flees from Ben and then sees the Macra for the first time. Her screams at this point and her cliffhanging realisation at the end of Episode 2 are quite nerve-jangling. Jamie (Frazer Hines), who didn’t have much to do in The Underwater Menace and The Moonbase, gets a more active role here as, with Ben having defected, the Scotsman is effectively promoted to the position of heroic male lead. Having penned the serials The Savages and The War Machines, writer Ian Stuart Black was more used to catering for William Hartnell, which may explain why Patrick Troughton’s Doctor is referred to as an “old man” on a few occasions. In common with The War Machines, the Doctor has to break a brainwashed companion’s mental conditioning. With its overtones of indoctrination, propaganda and a controlling authority seeing all through a static image on a television screen (a concept that would later feature in George Lucas’s THX1138), the story is clearly inspired by Nineteen Eighty-Four - but with the distinctly Doctor Who slant of having intelligent, evil crabs behind it all! As Wills and sound restorer Mark Ayres comment during an interview elsewhere in this box set, this serial works rather well on audio, because you cannot see the Macra themselves. Only one Macra prop was ever built, and from the few seconds of footage that survive, it appears that it wasn’t very mobile. Unlike children, the creatures are better heard about rather than seen - unless they are realised by decent CGI, as they were when they made a surprise reappearance in the new series episode Gridlock. It is not made clear how the creatures are able to move about at night without the aid of their vital gas, though the surviving tele-snaps suggest a fog, which could indicate that the gas is naturally present on the planet’s surface at night. In contrast with The Macra Terror, it helps if you can see the aliens in The Faceless Ones (and you can in a couple of surviving episodes in the Lost in Time DVD box set). A serial that relied on the visual gimmick of faceless creatures that can replace human beings by copying their physical forms is obviously going to lose something when presented entirely on CD. This six-part story does, however, offer several points of interest that do work on audio. The most notable of these is the character of Samantha Briggs (Pauline Collins), who teams up with the Doctor and Jamie in order to find her missing brother. This plucky character forms a close bond with Jamie, and quickly learns how to manipulate the chivalrous Scot with her feminine wiles. She and Jamie enjoy a more physical relationship than usual for ’60s Who - they kiss not just once but twice! Samantha would have become a companion if Collins (who subsequently played Queen Victoria in Tooth and Claw) had accepted Producer Innes Lloyd’s offer of a regular role in the series. Lloyd would ultimately recruit Deborah Watling as Victoria Waterfield in the next story, The Evil of the Daleks, to replace Ben and Polly, both of whom depart at the end of this serial. As with Jackie Lane’s Dodo Chaplet before them, Ben and Polly are rather unceremoniously written out during Episode 2. After that, they appear only briefly in a pre-filmed sequence at the end of the final episode, during which they take their leave of the Doctor. Another change that occurs during Episode 2 is the adoption of a reworked version of the opening theme, featuring tinkly elements (sometimes referred to as “spangles”) that would be retained right up to the end of Tom Baker’s penultimate season. It’s also worth listening out for several guest voices. Bernard Kay, a prolific actor who made several appearances in Who, plays Inspector Crossland. Wanda Ventham (here playing Jean Rock) and Donald Pickering (as Captain Blade) would eventually be reunited in Time and the Rani. And it’s always worth hearing Troughton’s performances as the Doctor - even if he does fluff his pronunciation of the word “Chameleon” during Episode 3! The plot is a little slow, as is often the case with six-parters, and the motivation of the alien Chameleons is ill-defined to say the least. They claim to have lost their “identities” and are dying out as a result, though it is never made apparent how one thing could lead to the other. Perhaps by “identity” they mean their genetic structure, the loss of which could cause sterility or disintegration... but who knows? Unlike the Macra, the Chameleons have never returned to the screen, though the Eleventh Doctor story The Rebel Flesh / The Almost People features a similar concept in the malleable form of the Gangers. This is actually the fourth commercial soundtrack release of The Evil of the Daleks. It was originally issued on cassette in 1992, with narration by Tom Baker, then re-released, remastered and with new narration by Frazer Hines, as part of the 40th anniversary Daleks tin set, with The Power of the Daleks. Following an individual release as a three-disc pack a year later, this seven-part epic is back in a box set again. Much of its visual appeal is, naturally, lost on audio. Scenes such as the opening search for the TARDIS, which was filmed on location, numerous fights with the mute Kemel (Sonny Caldinez), who communicates via sign language, and later scenes set on Skaro, simply don’t work as well as they would have done on television (though Episode 2 and some footage of the Daleks’ “final end” can be seen in the Lost in Time box set). However, there is still plenty to enjoy. David Whitaker’s script is full of superb dialogue, which ranges from the comic (“If only the Laird could see that!” gasps Jamie, as he beholds a girl in a very short kilt) to the deadly serious (“The Daleks will take pleasure in killing everyone in sight,” says the Doctor, “and their greatest pleasure will be in killing me”). We also witness Troughton’s Doctor at his most Machiavellian, appearing to assist his enemies, much to the consternation of Jamie, who has a heated argument with his travelling companion. Though we cannot see the corridors of the Dalek city during the final two episodes, fans will appreciate the welcome return of sound effects from the original Skaro story, The Daleks. Evil is also blessed with excellent incidental music, by the prolific Dudley Simpson, which includes a Dalek-style variation on the Doctor Who theme. Several Whitaker stocks in trade are evident, including his ongoing love affair with the mysterious force that is static electricity, which he previously explored in The Power of the Daleks. Like Lesterson in Power, Edward Waterfield (John Bailey) suffers an equally convincing breakdown as a result of his involvement in the Daleks’ diabolical plan. In common with Whitaker’s subsequent Wheel in Space Cybermen script, the monsters’ scheme seems rather over-complicated. The Daleks make contact with Waterfield in 1866, send him through time to 1966 to steal the Doctor’s TARDIS and set a trap. They arrange for the Time Lord to be brought back to 1866, then forward in time again for a trip to the planet Skaro. Surely there are simpler ways to ensnare the Doctor and harness the Human Factor. Still, all this obfuscation keeps the seven episodes ticking along very nicely indeed. The changes of time and location ensure that the serial is never dull. Structurally, what we have is a four-part central segment set largely in 1866, which is preceded by an opening instalment in 1966, and followed by a two-part conclusion on Skaro. In addition, the third disc of this story contains some appealing extra features. These include original Dalek voice recording sessions and the final seven minutes of the serial without narration. Best of all is the inclusion of the opening to the 1968 repeat screening of this adventure, which features an introductory voice-over by Troughton and Wendy Padbury in character as the Doctor and Zoe. And if that’s not enough, a further disc has been added, which includes PDF scans of the camera scripts for every episode in the box set and 37 minutes of interviews with Anneke Wills and Frazer Hines. The Wills interview is new, while the Hines material is assembled from bonus tracks from the previous audio releases, including The Tomb of the Cybermen and The Ice Warriors. The Evil of the Daleks is not without its flaws, but don’t give me the evil eye for saying that - it remains a classic nonetheless. Like The Evil of the Daleks, The Abominable Snowmen has been unleashed on three previous occasions. This adventure, which marked the Doctor’s first encounter with the Yeti, was initially issued on CD in 2001, then again in 2003 - twice - alongside its sequel The Web of Fear, first in MP3 format and then in a box set of standard CDs entitled Yeti Attack! If by some miracle you don’t already own it, this six-part story is worth a listen. The first two episodes romp along very nicely, and Frazer Hines’s voice-over sounds particularly sprightly as he has to gabble rapidly to fit his narration into the tiny gaps between dialogue and action. “I don’t fancy another tangle down the Cybermen’s tomb,” says Jamie during the opening TARDIS scene, a reference to the sole surviving serial from this season, which is therefore not included in this box set. Once we reach Episode Three, the pace slackens off considerably. Much of the dialogue and action are mere padding as a rogue control sphere takes its time to reach its target, and characters wonder who could be in league with the Yeti, even though the writers have already blown the identity of the Great Intelligence’s agent by this point. It’s a pity that writers Mervyn Haisman and Henry Lincoln could not have maintained the mystery for a little longer (but they learned from their mistake and would succeed in keeping the audience guessing throughout much of The Web of Fear). Things hot up again during the final episode, in which the enthusiastic narrator clearly enjoys describing things that EXPLOOOODE! Certain aspects of the production work better in this audio version than they did on television. For one thing, we cannot see how cuddly the supposedly terrifying Yeti were on screen (unless you watch Episode Two in the Lost in Time box set). Nor do we see the complete lack of snow on the location footage, which was filmed in Snowdonia in Wales during a warm August. It is interesting to note that while offering a scientific explanation for the legendary hairy beasties - as robotic instruments of the disembodied Great Intelligence - Haisman and Lincoln offset this by demonstrating that real Yeti also exist within the fictional universe of Doctor Who. The monks in the story speak of the creatures’ usually timid nature, and explorer Edward Travers (Jack Watling - father of Deborah) actually gets to see one at the end of the tale. It’s almost like one of those “so it is spooky after all” endings to an episode of The X-Files. Yes, the plot drags a little, but this shaggy Yeti story is far from being completely abominable. The Ice Warriors has much in common with The Tenth Planet in terms of its release history. Both had been issued in full in VHS box sets some years prior to their respective releases as soundtracks, though the videos have long since been deleted, and neither story has yet made it on to DVD. In the case of The Ice Warriors Collection, the four surviving instalments were presented on VHS, with the soundtracks to the missing episodes Two and Three included, without restoration or explanatory narration, on a single CD within the pack. In this version, the sound quality has been considerably improved, and linking narration is provided by Frazer Hines. As usual, the voice-over is relatively unobtrusive - in fact, there are times when a little more explanation would have been useful. Listeners who have never seen this story on video might wonder why Miss Garrett (Wendy Gifford) suddenly mentions “the vibro-chair” (oo-er missus). The reason, in fact, is that Leader Clent (Peter Barkworth) is feeling a bit faint. The plot is the standard “base under siege” format, complete with overwrought base commander. Surely even in 1967 viewers must have started to grow tired of the repetition by now, following the similarly structured The Tenth Planet, The Moonbase and The Abominable Snowmen. Here the twist is that human society has become over-dependent on computers. Leader Clent won’t commit to a decision without first running it past the base’s computer. Fans of Little Britain will love the fact that in the final episode Clent actually utters the words “computer says no”! However, even this twist would ultimately be repeated in the form of the overly logical Zoe in The Wheel in Space. Miss Garrett seems destined for some Zoe-type character development, resisting the authority of Clent and the computer during episode Three, but this plotline is discarded and by the end of the story she is as ineffectual as Clent. What guarantees this story its place in Who history is the debut of the Ice Warriors themselves, led by Bernard Bresslaw as Varga. Bresslaw establishes the Martians’ memorable hissing voices, and his performance is a million miles away from his better-known comedic roles in the Carry On... films. At no point during this adventure do Varga’s trousers fall down - though we do hear about an incident involving his backside and a shooting stick (oo-er missus) during the aforementioned interviews with Hines. Other notable guest stars include a pre-Last of the Summer Wine and Wallace and Gromit Peter Sallis as the iconoclastic scientist Penley, and a pre-Crossroads Angus Lennie as his fellow rebel Storr. Penley possesses some distinctly Doctor-ish characteristics - and he also has a Dr McCoy-ish moment, as he delivers the line: “I’m a scientist, not a gladiator,” (though Star Trek had not yet been aired in the UK when this serial was broadcast). Though scriptwriter Brian Hayles’s plotting is painfully slow at times, the advantages of experiencing this story on audio are that you don’t get to see how much the Ice Warriors’ heads change shape between episodes, nor that their appearance contradicts several indications in the dialogue that they resemble Vikings. 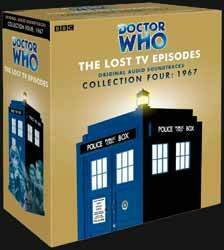 The serial and the collection are rounded off by an audio recording of the original BBC trailer for the next adventure to be transmitted, The Enemy of the World. Such trailers also survive on audio for The Abominable Snowmen and The Ice Warriors, so it’s a pity that they were not included as well. Despite its sluggish storytelling and the over-familiarity of its plot, The Ice Warriors is still pretty cool, and this box set as a whole is perfect for chilling out.